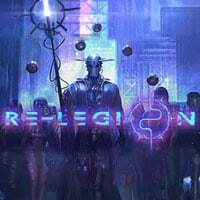 Re-Legion is an RTS game in a cyberpunk setting. The players take control of a religious cult, which is in conflict with other cults, corporations, and the infidels. Re-Legion is a cyberpunk real-time strategy game. The game was developed by a Polish studio, Ice Cide Games, and was supported by the 1C company. The action takes place in 2083. In the future imagined by the authors, the world is ruled by powerful corporations. In response to this state of affairs, cults start to sprout, they offer their members a way out of the grasp of the global corporations. The players take control of one of those groups. During the course of the game, you encounter resistance from other, similar groups and from the unfaithful. Re-Legion is a real-time strategy game. Over the course of the game, the players gather resources and lead armies, all in the effort of completing particular mission objectives or simply eliminating the enemy forces. The game features a few interesting mechanics that make it stand out of the crowd of “standard” RTS games. The main way to increase your army is to recruit civilians to your cult. In addition, the game revolves around taking over territory using hacking. Re-Legion offers both a campaign mode and online skirmishes. The authors have prepared a story mode, in which players have to make difficult moral decisions that influence the course of the story. The single-player mode was designed in such a way to make multiple completions of the game engaging and devoid of boredom. Expectations: 9.4 / 10 calculated out of 60 players' votes.